Bistek (or Bisteak) is a favorite Chamorro dish. 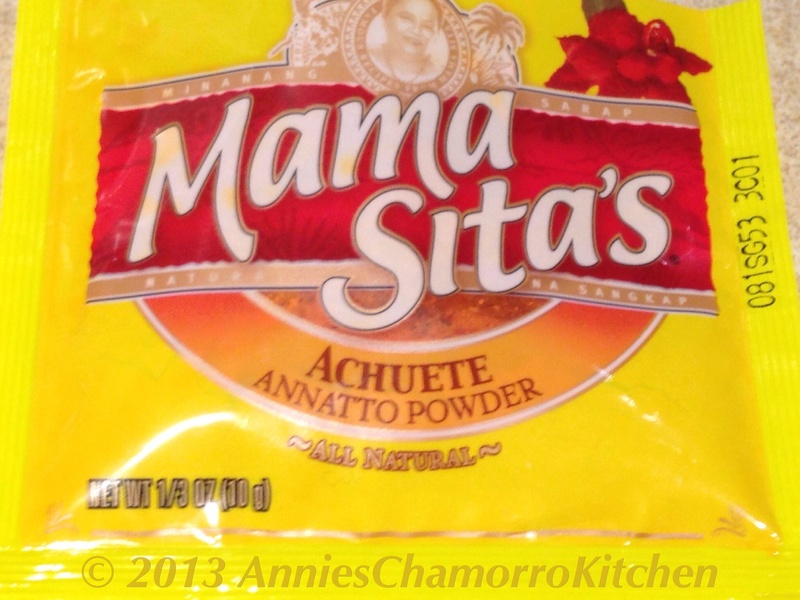 The addition of achote (or annatto) gives a unique flavor, along with the tanginess of the added vinegar. 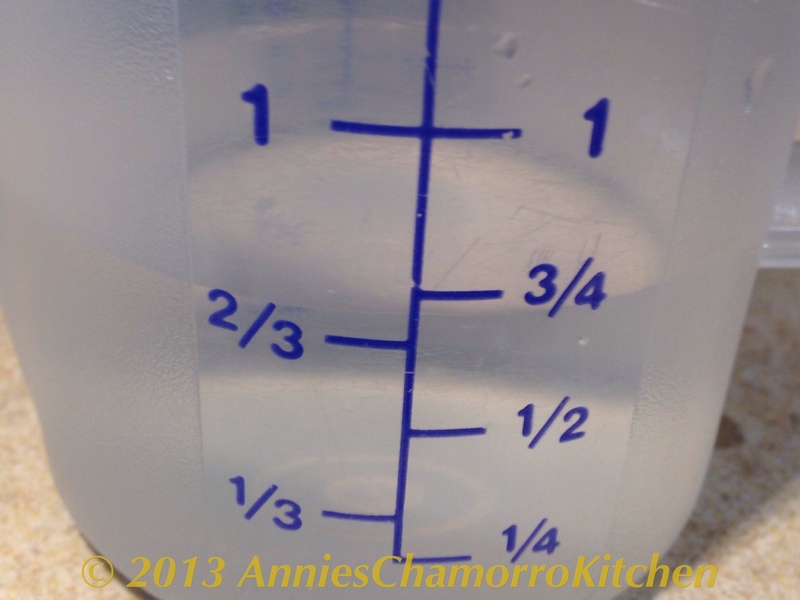 If you have it, I prefer using achote water made with fresh achote seeds. Fresh is always best, but of course, using achote powder works quite well too. This is what the packet of achote powder looks like. As with the Sazon Goya seasonings, achote powder is another item that is commonly found in either the Asian aisle of most grocery stores. If your local store doesn’t carry it, try looking for it in your local Asian supermarkets. 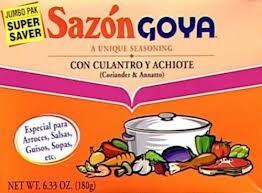 If you don’t have fresh achote seeds or achote powder, you can substitute with Sazón Goya seasoning that contains achote. This is what the packaging looks like. It’s a common item in the Hispanic aisle in most grocery stores. This dish usually includes peas as a main ingredient. 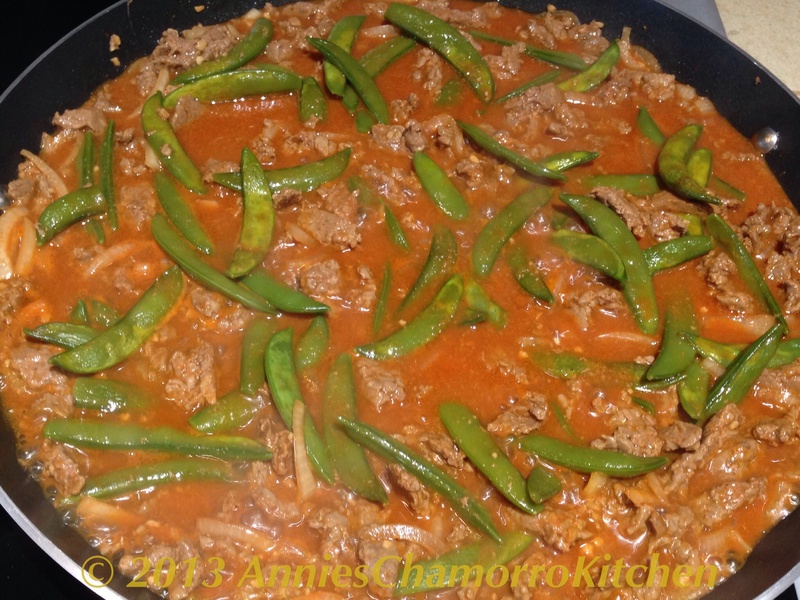 Some think that if you DON’T add peas, it isn’t Bistek, but my family prefers this dish made WITHOUT peas. We like using fresh or steamed green beans or sugar snap peas instead. It’s all up to you, really. With peas (or vegetables, for that matter) or without, it’s still a very tasty dish that is a must-add to your list of menu choices. 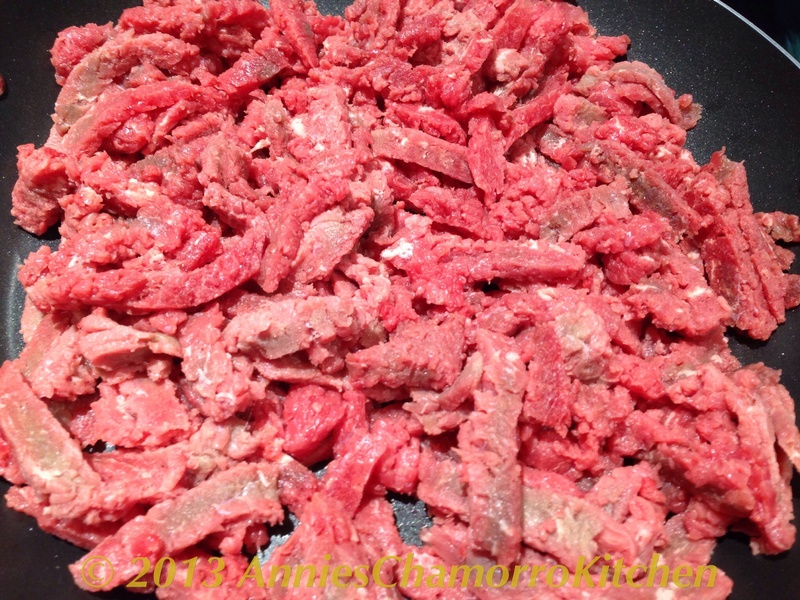 Place thinly sliced beef into a large frying pan. I like to use minute steak for this. Add Dashida seasoning, minced garlic, black pepper, and thinly sliced onions. Stir to combine all the ingredients. Cook over medium high heat until the meat is browned. Add to the pan white vinegar and soysauce. Stir to combine. Add water to the pan. 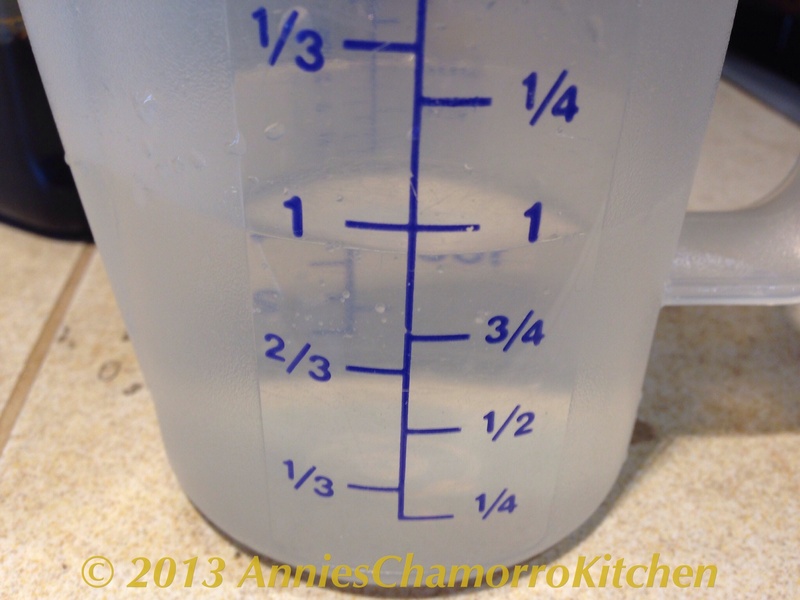 Add more or less water, depending on how much gravy you like. We like a lot of kådu (gravy)–adding about a cup of water will yield a lot of kådu. 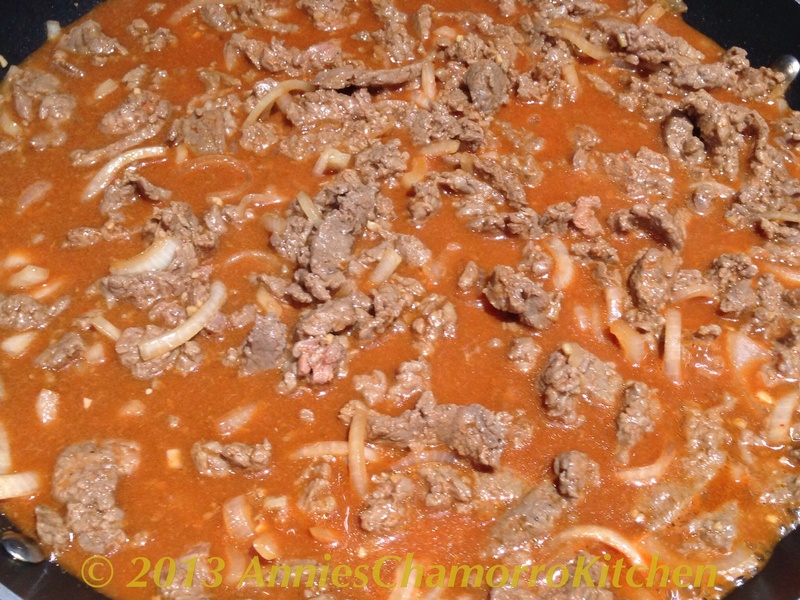 Cook for a couple of minutes–just long enough to reheat the gravy–then stir in achote powder (the achote powder will dissolve better if the liquid is HOT). NOTE: You can substitute the water and achote powder with achote water made using achote seeds. Cook for another couple of minutes then stir in fresh or frozen peas (OPTIONAL). My family actually prefers to use fresh sugar snap peas. Cook for a few more minutes, or just long enough to either reheat the frozen peas, or to cook the sugar snap peas to your liking (we like it al dente, or cooked but still crisp). You can also use fresh green beans instead of peas. 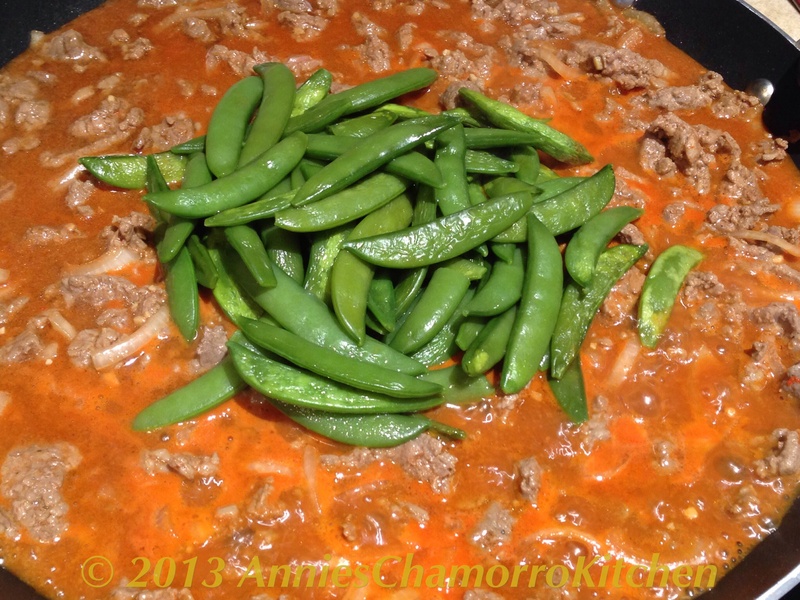 In the photo below, I used steamed sugar snap peas. 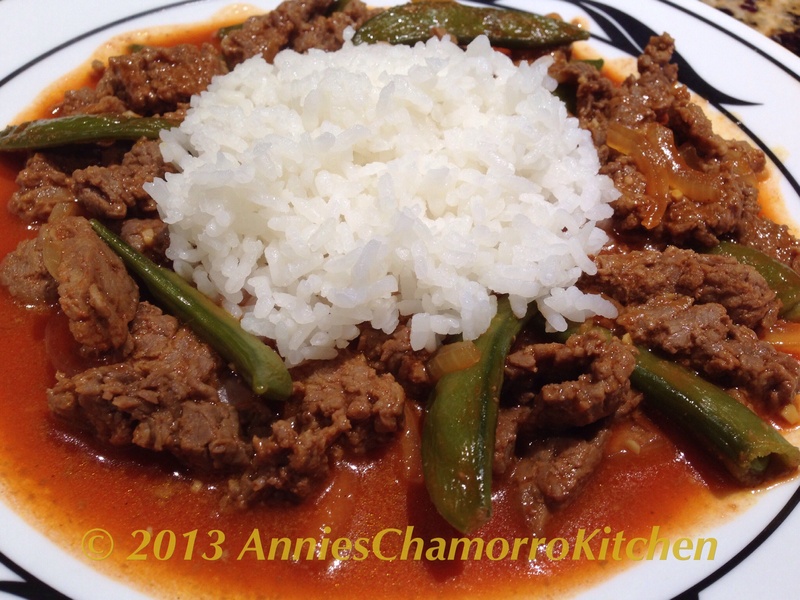 After the vegetables are cooked/reheated to your liking, remove the Bistek from the heat and serve with steaming hot white rice. ENJOY! 1. 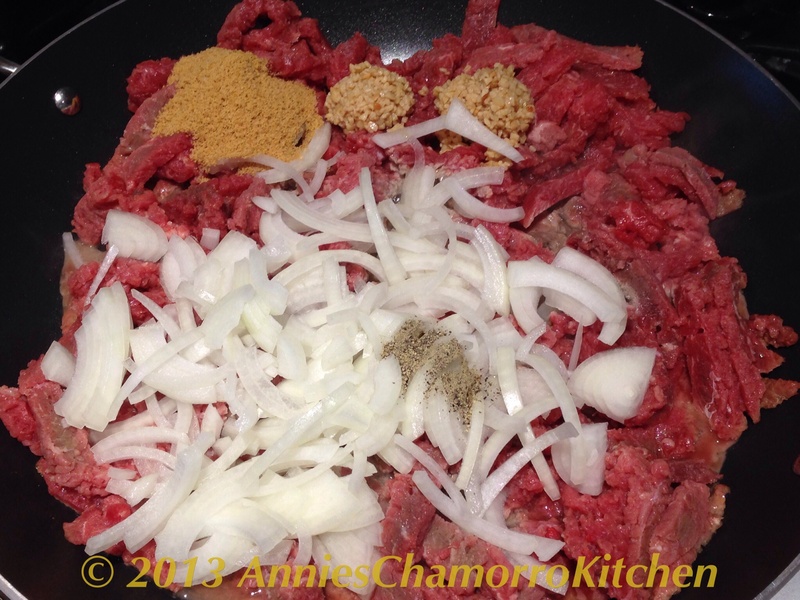 Place the beef, Dashida, garlic, black pepper, and onions in a large pan. Cook until the beef is browned. 2. 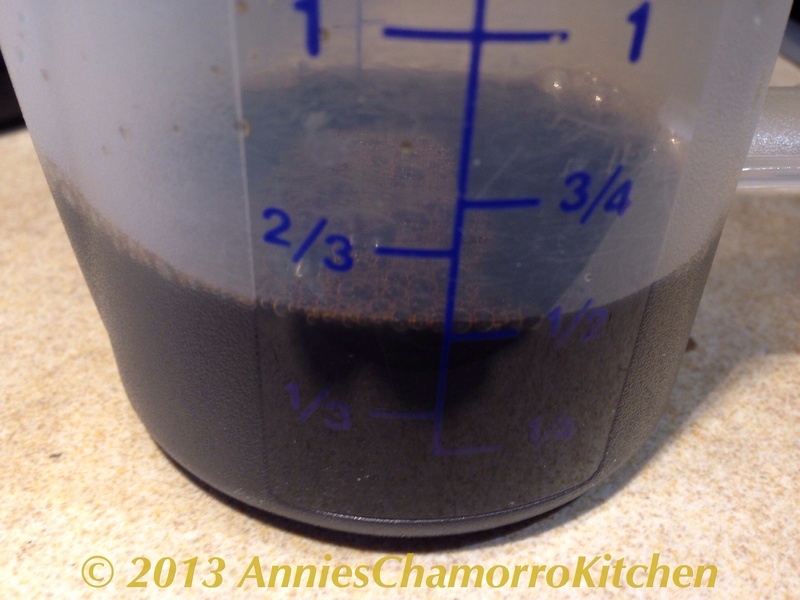 Stir in the vinegar, soy sauce, water and achote powder. Cook for about 5 minutes. 3. Stir in your vegetables. Cook long enough to reheat the vegetables (if frozen), or until the fresh vegetables are cooked to your liking.